Well, we've had our cranberry-laced breakfast, cranberry-studded dinner, and now dessert! This is one of my favorite cakes. Not only is it delicious and easy to make, but it gives you the feeling of being decadent when, really, it's pretty low-fat and it's made from whole wheat pastry flour. How good can it get? I had a bite or two of a similar cake at a local restaurant a few years ago and the memory lingered. It took me a while to get around to making a vegan version that came "up to scratch" with what I remembered, but I'm happy with this recipe. That particular restaurant still has the cake on its menu, but they've omitted what I would consider the essential caramel sauce and instead drown it in a pile of whipped cream! You can "gild the lily" with a small dollop of vegan whipped topping or non-dairy ice cream if you like, but don't leave out the caramel sauce! This cake actually isn't that decadent, but it really seems so! This is a great choice when you want something rich, not too sweet, and special, but not chocolate. It can be made either with fresh cranberries or dried cranberries. Preheat the oven to 350°F. Oil an 8" square pan and line the bottom with cooking parchment cut to fit. Whisk all of the Dry Mix ingredients, except for the pecans and cranberries, together in a medium bowl. Add the pecans and cranberries and mix briefly. Whisk together the Wet Mix ingredients in another bowl. Pour into the Dry Mix ingredients and stir briefly, just until mixed. Scrape the batter into the prepared pan. Bake for 35 minutes. Cool the cake on a rack. Bring the syrup, brown sugar, Earth Balance and salt to a boil in a heavy saucepan and boil over medium heat, stirring constantly, until the consistency of heavy syrup. Remove from heat and cool a bit. Heat the creamer just until warm. Whisk into the syrup along with vanilla. 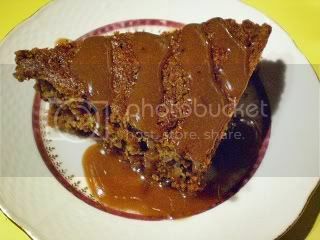 The cake can be served warm or at room temperature, but the sauce should be hot. 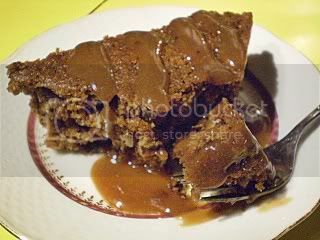 Cut the cake into 8 triangular servings and drizzle each serving generously with some of the hot sauce. You can also serve this with a scoop of your favorite vanilla non-dairy ice cream, or a little of your favorite non-dairy whipped topping. Nutrition (per serving): 485.6 calories; 33% calories from fat; 18.8g total fat; 0.0mg cholesterol; 163.5mg sodium; 368.6mg potassium; 80.5g carbohydrates; 4.9g fiber; 54.1g sugar; 5.4g protein; 10.5 points. Tonight's stew in the pot! Yesterday we started my 3-day cranberry-fest, suitably, with dried cranberries in our breakfast pancakes. Today, it's dinner (and we actually did have it for dinner tonight, with our friend Brenda, who is not a vegetarian, but loves my vegan stews). I like using fruit in savory dishes, especially tart fruits. I'm not sure exactly when I invented this stew-- it was at least three years ago-- but it was on a cold day, I know that for sure. 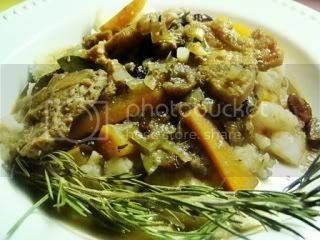 I remember wanting to come up with a stew with complex flavors, rich with wine, mushrooms, onions, and subtle herbs and spices. I think the dried cranberries were an inspired addition, if I may say so myself. They add a little edge of tartness (along with a bit of balsamic vinegar) to complement all the rich, deep flavors. It's become one of our favorite winter stews, and definitely a favorite for winter dinner parties. Reconstituted TVP chunks tossed with Seasoned Flour and ready to brown. 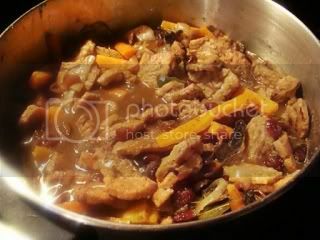 I need to add that I prefer textured soy protein chunks in stews-- I like their tender chewiness and their ability to absorb flavors. In the recipe, I have given you some possibilities for substitutes if you don't want to or can't use them, or have none available, but here's a little info. Textured soy protein is sometimes called TSP, but is also known as the brand TVP®. It's a low-fat, inexpensive dry product that’s useful as a meat substitute. It is not the same thing as “ hydrolyzed plant protein” or “soy isolate,” BTW. 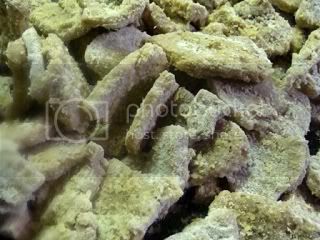 It is made from de-fatted soy flour, cooked under pressure, then extruded to make different sizes and shapes, then dried. I use So Soya Slices, made from fat-free soy flour (not genetically modified) and that's the only ingredient. 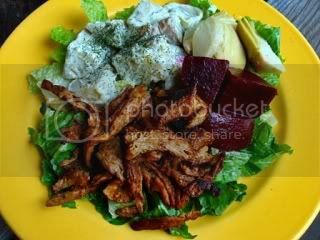 One of the alternative suggestions in the recipe is commercial "meaty" vegan strips, "tips" or "tenders". These products are generally made from a combination of soy and wheat proteins. Common brands are Gardein, Yves, Lightlife, Morningstar Farms, White Wave, and PC Blue Menu (Canada). They are available in natural food stores and large supermarkets, either refrigerated or frozen. Some online vegan vendors will ship them with cold packs. Ready to eat on a nice mound of mashed potatoes. Quick to put together; elegant enough for company. All you need is mashed potatoes, maybe some crusty bread, and a salad. Heat the oils together in a large cast iron or non-stick skillet. Coat the TVP chunks with the Seasoned Flour, shake off excess, and brown them in the hot oil. 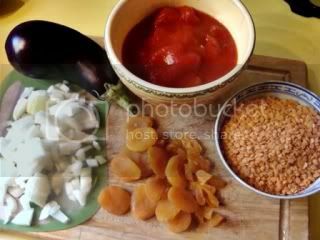 Remove the browned chunks to a bowl and then add the onion and garlic; sauté, adding a little water if necessary, until the onions are softened. Mix the onions and TVP chunks in a large, heavy pot along with the remaining ingredients and simmer for 1 hour. Add freshly-ground black pepper to taste. Serve hot with mashed potatoes. Nutrition (per serving): 567.4 calories; 11% calories from fat; 7.6g total fat; 0.0mg cholesterol; 327.4mg sodium; 928.9mg potassium; 104.0g carbohydrates; 8.5g fiber; 2.9g sugar; 95.5g net carbs; 16.9g protein; 11.2 points. Nutrition (per serving): 425.6 calories; 11% calories from fat; 5.7g total fat; 0.0mg cholesterol; 245.5mg sodium; 696.7mg potassium; 78.0g carbohydrates; 6.4g fiber; 2.2g sugar; 71.6g net carbs; 12.6g protein; 8.2 points. Cranberries are one of my favorite foods and the holiday season gives me plenty of opportunities to use this tart, healthful fruit in many dishes, both sweet and savory. I'm going to devote the next three days' posts, the remaining days of MoFo, to the cranberry and its uses, along with three of my favorite recipes using this ruby-red berry (in the case of the aforementioned recipes, it will be in the dried form). I developed this recipe about 3 years ago when I was determined to make a light, fluffy vegan pancake that was all whole grains but didn't SCREAM whole grain. For a holiday recipe, I added one of my favorite flavor trios: orange, cranberry and pecans. Some of you may know that I'm in favor of using our healthful, antioxidant-rich North American berries, such as cranberries, blueberries, blackberries and currants, instead of jumping on every passing bandwagon of exotic, supposed "super-fruit" (such as goji or acai, for instance). I wrote a bit of a rant about this, as a matter of fact, about 4 years ago, so I'll let you read it if you like, rather than repeating myself. But a few facts: Native Americans used cranberries for food and medicine, both raw or or cooked and sweetened with maple sugar. In addition, they used them in poultices for treating wounds, and the leaves for diarrhea and urinary disorders. 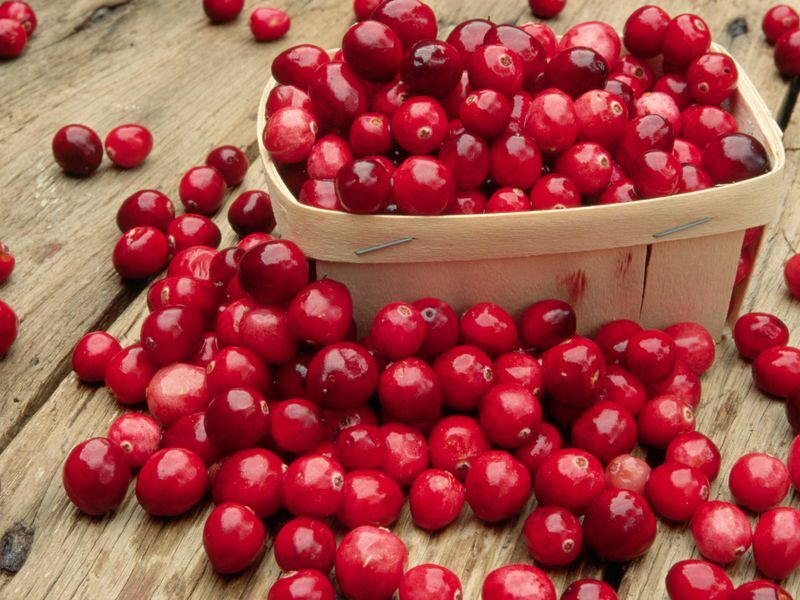 Cranberries were also used to prevent scurvy. Cranberry juice may prevent the formation of certain types of kidney stones. A glass or two of cranberry juice every day for 1 to 2 weeks will increase the acidity of the urine, and decrease the risk of a kidney stone formation. As an added bonus,cranberry juice does not contain high levels of oxalate, a substance which can promote the formation of kidney stones. That's enough science for today-- more facts to follow in the next 2 days! Give the pancakes a try. They contain four different kinds of whole grain flour, a combo that makes a very light pancake. I like to keep all of these flours together in the freezer to have at a moment's notice when we feel like having pancakes, without scrambling around to find everything. Light, fluffy ALL-whole-grain vegan pancakes with the added fiber and antioxidants of flax, cranberries, and pecans. You can use this recipe as a template for plain multi-grain pancakes or pancakes with other flavors, fruits and nuts or seeds. VARIATION: For plain pancakes or other flavors: omit the orange juice and use 2 tablespoons lemon juice plus non-dairy milk to make 2 1/2 cups). 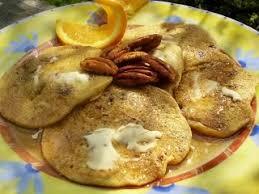 Omit the cranberries and nuts for plain pancakes, or use other dried fruits and nuts or seeds. Step 3) Mix together the Dry Mix ingredients together in a medium bowl-- I use a whisk. Stir in the cranberries and pecans. Set aside. 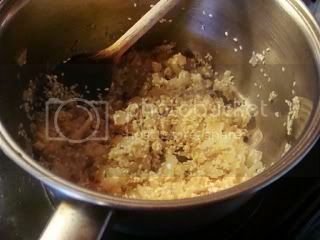 Step 5) For the Wet Mix, combine the Vegan "Buttermilk" and the Vegan "Eggs" together briefly, and stir in the oil. Pour it into the Dry Mix. Whisk briefly just until no dry flour is visible-- it will be lumpy and quite thick. Step 6) Spoon 2-3 tablespoons of the batter onto the hot, oiled griddle and spread it out gently to a 3 1/2" circle with the back of the spoon. (I use a small gravy ladle that holds about 3 tablespoons of batter and that's perfect.) Cook until it has puffed a bit, bubbles appear in the surface and the bottoms are golden. Carefully loosen with a spatula/pancake turner (if using a plastic one, make sure that it has a nice thin edge on it) and turn over gently. The center will rise a bit and be set, and the other side golden when done. Don't overcook the pancakes, or they fall and lose their lightness. Serve on warm plates with Earth Balance and warm syrup (we like real maple syrup) or amber agave nectar. Yum! Nutrition (per 4 pancakes): 415.0 calories; 20% calories from fat; 10.0g total fat; 0.0mg cholesterol; 310.8mg sodium; 373.9mg potassium; 77.5g carbohydrates; 10.4g fiber; 3.5g sugar; 67.1g net carbs; 7.2g protein; 8.3 points. Nutrition (per 4 pancakes): 214.2 calories; 24% calories from fat; 5.9g total fat; 0.0mg cholesterol; 309.0mg sodium; 332.3mg potassium; 36.3g carbohydrates; 6.8g fiber; 3.3g sugar; 29.5g net carbs; 6.8g protein; 4.0 points. 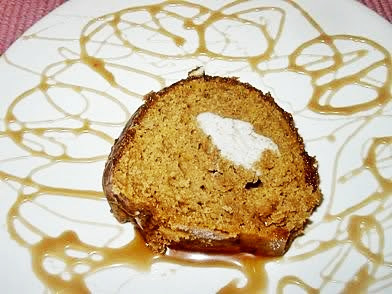 I've been saving this recipe to post for a special occasion, and there are three special occasions coming up that could benefit from the addition of this dessert to the menu (UPDATE: Four in 2013 because Chanukah falls at American Thanksgiving this year)-- Halloween, American Thanksgiving, and Christmas. I developed this cake a few years ago for my now defunct newsletter, The Vegan Feast, and this is the first time I've shared it with the public-- I hope some of you will try it and enjoy it as much as we do. The ginger-y vegan cream cheese filling is a perfect foil for the soft moist, lightly-spiced pumpkin cake, and it's complemented very nicely with a drizzle of sumptuous vegan caramel sauce and a sprinkling of toasty pecans. 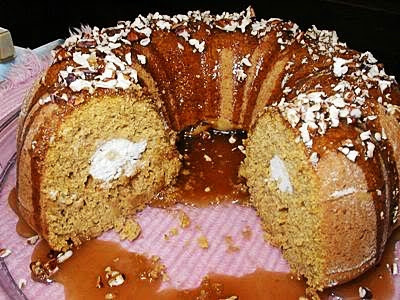 Tunnel cakes now come in all flavors, but the original was the "Tunnel of Fudge Cake". Tunnel of Fudge Cake was created by Ella Helfrich of Houston, Texas. She was a Pillsbury Bake-Off 2nd place winner (she won $5,000) in 1966. Her Tunnel of Fudge cake is a walnut-studded chocolate pound cake that comes out with a fudgy-wet center and a crusty, dryish brownie-type surrounding. The cake became an immediate national sensation. In fact, it introduced the Bundt pan to mainstream America. Until then, it was mainly ethnic bakers who used the pan, but once the recipe was printed in newspapers and magazines, Pillsbury alone received 200,000 requests for this newly designed type tube pan. Pillsbury came up with a "from scratch" version of the original recipe (which used an icing mix no longer in production), which contained 6 eggs and resulted in the fudge center. However, other versions eventually came about with a solid filling sandwiched between the two layers of batter. Since a vegan cake can't use 6 eggs, and it's very difficult to "veganize" a recipe with that many eggs in it, that's the version I opted to start with when I developed this recipe. It's not difficult to make and, as you can see from my friend Debbie's photos, if you follow the directions, it will come out perfectly! UPDATE: For a soy-free version: In the Filling, use the Soy-Free Cream Cheese-Mascarpone on p. 202 of my book World Vegan Feast. Make 1 1/2 times the recipe and then add the vanilla, sugar, lemon zest and ginger in the filling recipe for the cake. In the cake, use non-soy nondairy milk or creamer and use a soy-free vegan butter such as my homemade palm oil-free vegan Buttah. Crumble the tofu into a clean tea towel or a nut bag and gather up the ends. Twist and squeeze repeatedly until the tofu is as dry as possible. Beat all of the frosting ingredients EXCEPT the candied ginger in a food processor until very smooth. Stir in the candied ginger. Refrigerate until ready to fill the cake roll. Preheat the oven to 350° F. Grease a 10" nonstick bundt pan and dust with flour, or use my homemade palm-oil-free, non-hydrogenated cake release (recipe below). Sift together the Dry Mix ingredients into a medium bowl and stir them together well. In a large measuring pitcher, mix together the pumpkin and 1/2 c. nondairy milk; set aside. In a large bowl, beat together the Sugar Mix ingredients with an electric mixer at high speed for about 5 minutes, scraping the sides of the bowl with a silicone scraper now and then. 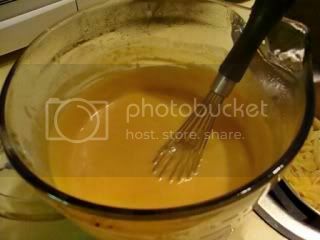 At low speed, beat in the Dry Mix, alternately with the pumpkin mixture, 1/3rd at a time. Then beat for 1 minute. Spread half of the batter in the prepared bundt pan. Drop small spoonful of the Creme Cheeze Filling in a ring in the center of the batter, all the way around, as evenly as possible. 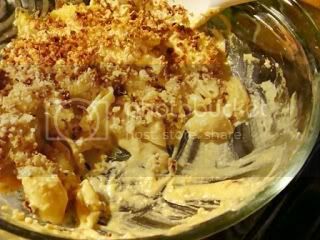 Carefully top with the remaining batter and smooth the top over the Filling. Bake the cake for 50 minutes, then test with a cake tester. Bake a little longer if necessary (in 5 minute increments). Cool in the pan on a rack for 15 minutes, then loosen carefully around the edges and invert on a serving plate. Bring the syrup, brown sugar, vegan butter and salt to a boil in a heavy saucepan and boil over medium heat, stirring constantly, until the consistency of heavy syrup. Remove from heat and cool a bit. Heat the nondairy milk or creamer just until warm. Whisk into the syrup along with vanilla. This sauce is served hot on some desserts, but I like it better chilled for this cake. 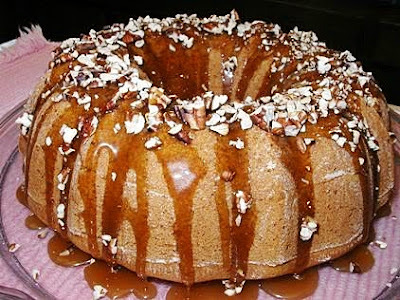 To serve: Drizzle the cake with chilled Caramel sauce and sprinkle with toasted pecans or alternate. Nutrition Facts: Nutrition (per serving/1/16th of cake): 291.1 calories; 23% calories from fat; 7.8g total fat; 0.0mg cholesterol; 217.0mg sodium; 309.7mg potassium; 51.6g carbohydrates; 2.4g fiber; 30.3g sugar; 49.2g net carbs; 5.5g protein; 6.0 points. Use a hand immersion blender or electric mixer (a stand mixer if you are making a large amount) and mix until fluffy. Use a pastry brush to apply the coating on the inside of your pan--no need to flour after applying. Store the mix in a covered container in the refrigerator. OUR 1ST WINNER DID NOT CONTACT ME AFTER 1 WEEK, SO WE HAVE ANOTHER WINNER, in2insight! I will contact you. Congratulations! 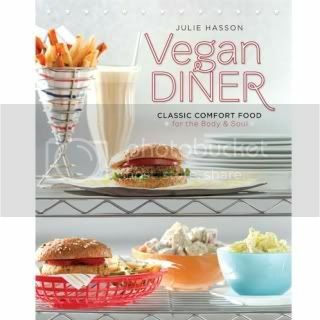 It's past due for me to do a review AND a book giveaway (see info at the bottom of this post) of my friend Julie Hasson's wonderful book, Vegan Diner, on this blog. If you haven't seen this book, or purchased it yet, you are in for a treat! 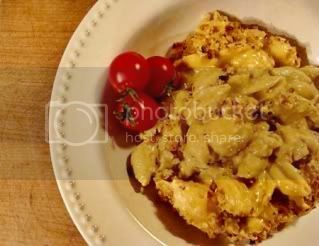 Not only do we all have some diner favorites that we would love to be able to eat again as vegans, but it looks wonderful, with delectable color photos of many of the recipes, and stylishly retro diner scenes. The content is a perfect combination of familiar and original. 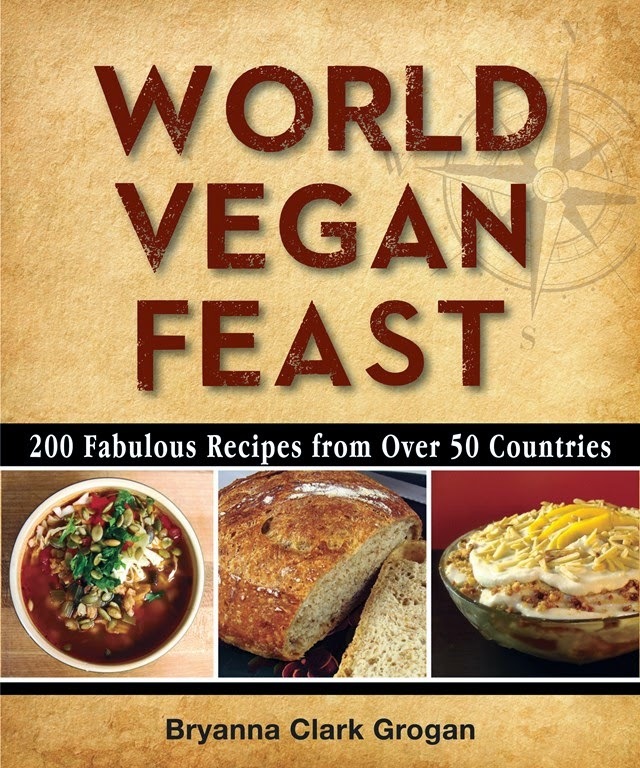 There are old favorites like All-American Beer-Battered Onions, Ooey-Gooey Brownies, and Biscuits with Creamy Sage Gravy, and then innovations such as Spelt Chai Pancakes, Vampire Fries, and Philly Seitan Sliders, to name but a very few of the tantalyizing recipes in this book. Recently we had a couple of really delicious and quick meals from Julie's book that I'd like to tell you about. I had a yen for "macaroni and cheese" the other day, and needed a quick meal at the same time. (Actually, I had just got home from work on the 6:30 ferry. DH usually has dinner waiting for me on Friday nights, but he's been teaching a photography course at the college in Courtenay for a few weeks, so we've both been coming home on the same ferry.) I had heard so much about Julie's Cheezy Mac that I decided to try it. It looked quick and easy-- and it was! I was out of elbow macaroni, so I used medium shell pasta, and I think I'll use that from now on! The shells make little "cups" to hold more of the sauce, so each bite is sumptuous! While the pasta boils, you make the sauce, which tastes much richer than it actually is. I cheated a bit and cooked the sauce in the microwave, which worked perfectly. It was creamy and rich-tasting-- a very satisfying meal! We served the two dishes together on a bed of lettuce with pickled beets and marinated artichokes-- fantastic! I haven't even gotten to the desserts yet-- there are so many recipes to choose from! If you'd like to win a copy of Vegan Diner, comment below on why you'd like to lay your hands on this book and DH will choose a winner on Thursday night (the 27th). I'm afraid that the publisher has stipulated that only Americans can join in the contest. It's the 2nd Big Vegan (by Robin Asbell) Potluck day and I chose to make the Armenian Red Lentil-Apricot Stew with Sesame Rice. I love Armenian cooking and this sounded like a lovely blend of sweet and savory. The ingredients for the stew are so colorful! As Robin mentions in the book, all you need to make this a whole meal is a salad. A bonus is that it's a very easy meal to prepare-- a little chopping, rinsing the lentils, measuring out the spices and that's it, really! Sauteing the shallots, sesame seeds, and rice kernels before adding the liquid. My husband and a friend shared this together and were all impressed by the combination of the rice bathed in mild humus flavors (tahini and lemon juice, in addition to the toasted sesame seeds) with the hearty, flavorful stew. We particularly liked the addition of the dried apricots, which added a real zing to the dish, already redolent of sweet and hot spices and the fragrance of mint. It is actually a perfect autumn meal! Red lentils simmer into a creamy stew, piqued with bits of tangy apricot and tender eggplant. The warming spices make it even more delicious, perfect over the sesame-fortified brown rice. 1. 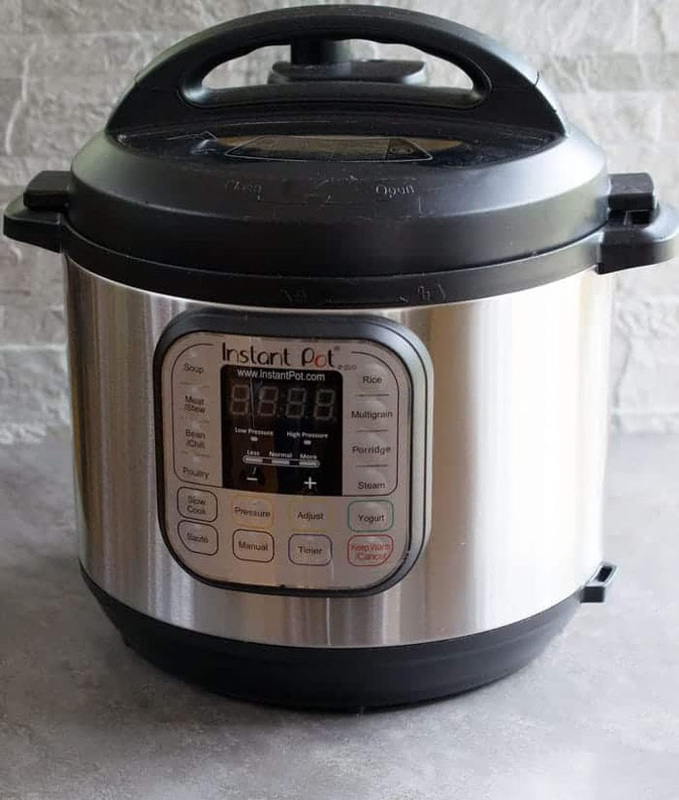 In a 4-qt/3.8-L pot, combine 1 qt/960 ml water, the lentils, and onion. Bring them to a boil over medium-high heat, then reduce the heat to a simmer. Cook for 10 minutes, stirring frequently. 2. Add the eggplant/aubergine, tomatoes, and apricots and simmer, covered, for about 20 minutes, stirring every 5 to 10 minutes. 3. When the lentils are falling-apart tender and the vegetables are also tender, add the paprika, salt, cinnamon, allspice, and cayenne and simmer for another 5 minutes to marry the flavors to bring the flavors together. Add the parsley and mint just before serving. Keep the stew warm while cooking the rice. 1. To make the rice: In a 2-qt/2-L pot over medium heat, sauté the shallots in the oil . 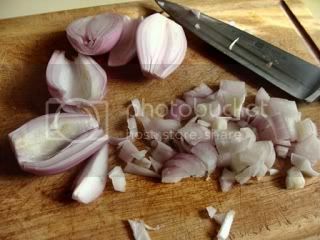 When the shallots are clear and soft, add the sesame seeds and sauté for 5 minutes. 2. Add 3 cups/720 ml water, the rice, and salt. Bring them to a boil, then reduce the heat to a low simmer and cover. Check after 35 minutes. When all the water has been absorbed, remove the pot from the heat and let it sit, covered, to finish steaming the rice, 5 to 10 minutes. 3. In a small cup, stir together the tahini and lemon juice, then fold them into the rice. 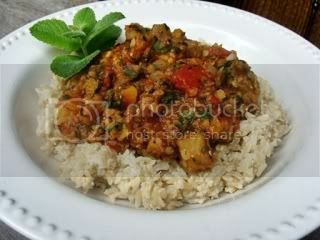 Serve the rice hot with a ladleful of stew on top. 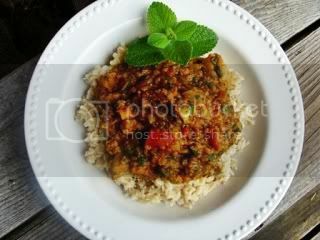 Click here to follow Big Vegan's virtual potluck and get more of Robin's recipes. 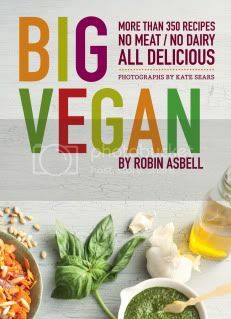 To learn more about Big Vegan, check out Robin Asbell's YouTube video. Please read, comment, and take a moment to scroll through these wonderful blogs. Every one of these writers has great articles, recipes, and books that might just make you a regular reader. 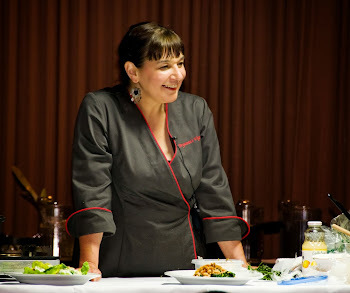 This will be a short post-- it's been a long week of writing and cooking! This is a muffin (almost a cupcake, really) that I developed for my old newsletter, The Vegan Feast, about four years ago and it has remained a favorite ever since-- maybe because they contain three of my favorite dessert ingredients (make that four-- I forgot the cocoa nibs). They're not as caloric, fat-laden or decadent as they seem, and they are whole grain, but they satisfy a sweet craving most delightfully! What can be better than biting into that moist sweet crumb, releasing the fragrant oils of the orange zest, with chunks of dark melty chocolate, toasty pecans and the unexpected crunchy bitterness of roasted cocoa nibs? Preheat the oven to 400 degrees F. Prepare 12 muffin cups by greasing or spraying with oil (if you use paper liners, also spray them with oil), or lined with silicone muffin cup liners. Combine the Wet Mix ingredients in the blender or food processor. In a medium bowl, whisk together the Dry Mix ingredients. Stir in the chocolate, pecans and cocoa nibs just to coat. Add the wet ingredients to the dry and stir briefly just to mix. Spoon evenly into 12 prepared muffin cups. Bake for 20-25 minutes. Cool the pans on racks for 5 minutes, then carefully loosen the muffins with a table knife and turn them on their sides to cool a bit more before serving (low-fat vegan muffins are quite tender when they are very hot-they firm up with cooling). 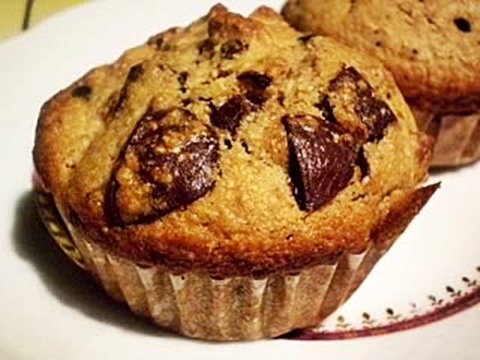 Nutrition (per muffin): 244.0 calories; 41% calories from fat; 11.8g total fat; 0.0mg cholesterol; 145.1mg sodium; 176.8mg potassium; 33.9g carbohydrates; 3.6g fiber; 9.5g sugar; 30.3g net carbs; 4.0g protein; 5.2 points. 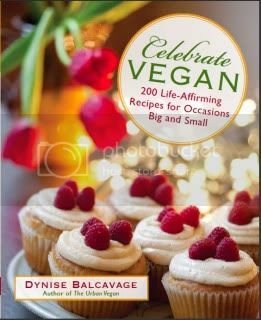 The promise of a new book by Dynise Balcavage, the Urban Vegan, has caused eager anticipation among fans of her blog and her first book The Urban Vegan. The complete title of her new book is Celebrate Vegan: 200 Life-Affirming Recipes for Occasions Big and Small, and it delivers! Dynise covers 48 holidays, divided into the following categories: New Year's Celebrations (from four cultures); American Celebrations (the usual ones, plus Martin Luther King day and Festivus, the festival for nonconformists, of Seinfeld fame); nine International Celebrations; Religion-Based Celebrations (from Candlemas to Eid al-Fitr); Milestone Celebrations (from birth to burial); and seven fun Everyday Celebrations. Dynise likes to surprise, so be prepared. Consider her Lunar New Year Supper, for instance, featuring Lemon-Champagne-Braised Baby Bok Choy, Tofu with Broccoli and Black Bean Sauce and, for dessert, Mandarin Orange Upside-Down Cake (“a fun twist on a classic American dessert recipe”-- indeed!). 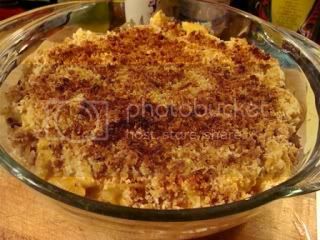 Or, from the American Holidays section, the Martin Luther King Day "Soul Food Fit for a King" supper, sometimes traditional and sometimes darn right innovative: Sweet Mint Tea, Thai-Centric Creamy Mac (“not your grandma’s mac and cheese”), Dirty Rice and Lemon-Cornmeal Diamonds. 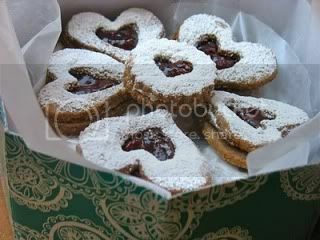 In this book, the "Heartfelt Linzer Cookies" are for Valentine's Day, not Christmas! Guy Fawkes Day, a British Holiday with a long and rather violent past, inspired "Kinder, Gentler Bonfire Fare", featuring London Particular (a split pea soup), Indian Shepherds Pie, and Pimm’s Cup (a British cocktail). I made the Indian Shepherds Pie for dinner a few nights ago. 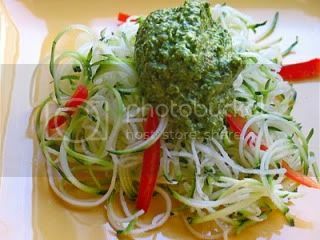 This recipe is a brilliant idea, given the long relationship of the British Empire with the Indian sub-continent, continuing to this day with the large Indian population in the UK. Dynise described the dish as a sort of "deconstructed samosa", which is very apt. 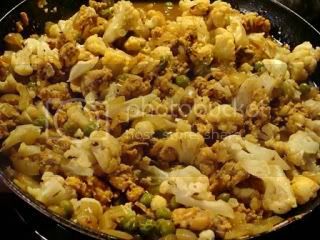 I used the cauliflower option in the filling because cauliflower, pea and potato is a popular samosa filling. The spicy filling features tempeh, which my husband claims to dislike, but I had some in the freezer, I had everything else in the house to make this dish, and I decided to take a chance. The dish was calling to me, and, besides, I like tempeh, and I don't have it very often. This has a happy ending, though. I didn't tell him that the dish contained tempeh until he had tucked in and started going on and on about how great it was! 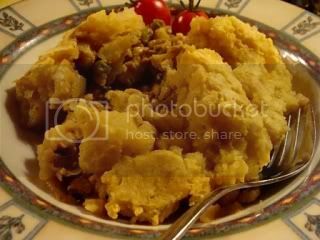 The spicy tempeh and vegetable filling. The festive and unusual Christmas Eve "Feast of the Seven Grains" is the vegan equivalent of the traditional Pan-European "Feast of the Seven Fishes"-- genius! In the Everyday Celebrations section, the "Tailgate Party" features Spicy Seitan Wings, pretty traditional, but wait-- there's a surprising Cumin-Harissa Dipping Sauce and Chocolate Popcorn to finish. And then comes the "Raw Celebration": Zucchini “Linguine” with Lemony Spinach Pesto, Truffle-Stuffed Dates and Ruby Red Cocktail. That's just a small sampling of the original menus and recipes that go with them. Traditional sometimes, but always with a (sometimes quirky) twist. You'll have fun with the food in this book, and so will your guests. 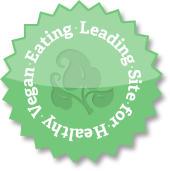 As an added bonus, Dynise has included a list of online resources, a recipe index by category, and some reassuring information on "veganizing" traditional recipes, baking without eggs, and much, much more. You're going to love this book! 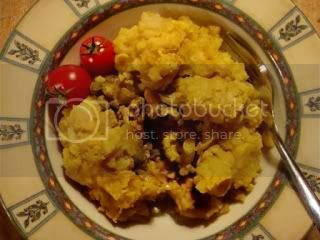 I know-- you're probably wondering why I'm talking about clogs on a cooking blog, and, of course, this is Vegan Month of FOOD. But I think that this is an important topic for those of us who spend alot of time MAKING food. On a personal level, not only am I on my feet alot (and not as young as I used to be), but I also have "foot issues". I've been on a mission to find a comfortable, supportive VEGAN clog, which I can also wear to my "day job" at the library. It has to be a "comfort clog". It has to support the arches (regular and metatarsil) and it has to have a raised "rocker" toe to keep pressure off the toes. Over the years I have had difficulty finding vegan shoes that fit the bill. Birkenstock has some vegan shoes and clogs, but they didn't work for me; nor did vegan Earth Shoes. And I really don't like to wear athletic shoes st work! I knew about Dansko clogs, of course, and their reputation as a great work shoe, but, being a country girl without access to big city shoe stores, I did not know that they had vegan clogs with the same construction values as their other shoes. Recently, while perusing shoe websites online, I discovered the world of Dansko vegan clogs! There are some pretty nice-looking styles. I wanted to share this with you because I can't be the only vegan with foot issues or just plain tired feet! Your local shoe store might be able to get them in for you, and you can also check out zappos.com and many other shoe stores and sites.There's a "store finder" and a list of stores on the Dansko website at this page. Canadians, this online store carries Dansko (they only carry 3 vegan shoes that I can see: Voley Floral Rose, Volley Hopsack Sand, and Volley Canvas Navy) and so does this one (they only carry the Volley Floral Blue canvas and Dansko Veda clog/Oxford in beige or navy canvas and white-- not shown on this post). These 100% animal-free shoes are made entirely of vegan materials but sport exactly the same construction and frame as the original. Available in canvas, cotton and acrylic uppers in a variety of colors and patterns, they have Dansko’s supportive footbed and signature rocker bottom. And here's a page that tells you how to care for and clean these fabrics. A lighter version: "Lighten up with our new Sanibel collection. Part sneaker, part clog—all Dansko! "